Aaaaaand we got a race! That's right, after weeks (months?) of the Progressive Conservative Party of Doug Ford clearly leading in the polls (and the seat projections), we now have a close race between this party and the NDP of Andrea Horwath. This is honestly quite impressive given how big the PC lead was just a few weeks ago. If the Tories end up losing this election, I'm sure people will compare them to the Maple Leafs and the famous blown lead to Boston. After a few days where online polls were showing a tight race (with the NDP sometimes ahead) while phone polls (Ekos, Mainstreet) kept showing the PC way ahead, things changed yesterday. Frank Graves, Ekos' CEO has tweeted that they now see big shifts and the NDP is first. They should publish the poll today (the preliminary results leaked on Twitter were literally showing the NDP with a 10 points lead!). As for Mainstreet, its CEO Quito Maggi has also Tweeted something similar and we should start seeing the changes in their daily trackers (although, since it's a 3-days tracker, it'll take some time). We also know Forum will publish a poll on Thursday and rumours are that they have the NDP very, very high. Edit: Yup, the Forum poll is up and this party is at freaking 47%! If you want to see what the projections would look like with these numbers, just use the simulator. All that to say that the projections below will most likely be outdated very, very soon. But even if that's the case, you can see a very different race with the NDP within striking distance of the Tories. Edit: I updated the projections with the new poll from Forum. For the first time, the polling average has the NDP ahead. The probabilities for a majority are only 43.2% for the PC and 19.1% for the NDP. You can find all the details at the bottom of this post. 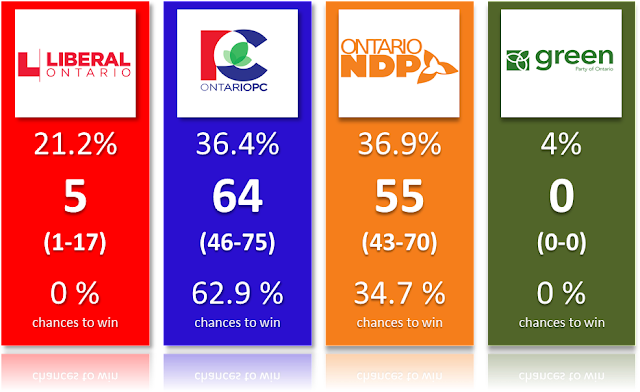 Since the projections won't be valid for very long, I want to focus instead on what a close PC-NDP race, with both parties around 36%, would look like. Of course, I'm assuming here that the race will indeed remain tight for a while and the NDP won't take a large lead. But this scenario is far from impossible but let's ignore it for now. If the rumored Ekos and Forum numbers are true, we are talking of an orange wave and all this article here is for nothing. Oh well. The model seems to show that in this case (the close race), the Conservatives would have the edge with vote efficiency. In order to fully represent this, I used my simulations and estimated the function below. 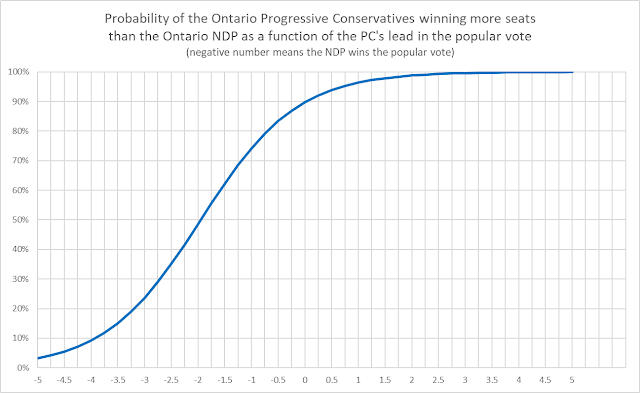 This is showing you the chances of the PC winning more seats (majority or not) than the NDP as a function of the PC lead in terms of votes (so it's negative if the NDP gets a higher percentage of vote). This is valid for the NDP and PC around 36% and the Liberals around 20%. If no party has an edge, then the chances of winning should be exactly 50% if the vote spread is 0. In other words, if two parties were to get (say) 36%, then they both should have a 50% chance of winning. So one way to capture the edge of one party is to see where the 50% chance is. As you can see, the 50% mark is when the PC is around -2 points, which means the NDP needs to win the popular vote by 2 percentage points (ex: 38% versus 36%) in order to have the same chances as the PC. Another way to say this is that if the two parties are actually tied, the PC has around 90% chances of winning more seats. Just to be clear here, the projections above show the PC with around a 2 points lead and "only" 80% chances of winning. So you might be confused because this graph here shows that if the PC wins by 2 points (+2 on the x-axis), then the PC has over 90% chances of winning more seats. The probabilities here and in the projections above aren't representing the same uncertainty. In the projections, it is accounting for the possibility that the polls are wrong. And we know they can be. On the other hand the graph here shows the uncertainty due to the distribution of the vote (or the electoral system). So at PC +2, this is really looking at the possible seat distribution if the Tories were to actually receive 2% more votes. See the difference? 2 points is a fairly big advantage although this is less than the usually accepted 5 points lead the Liberals need to have on the PQ in Quebec since the Liberal vote is heavily concentrated in non-francophone ridings (note: I don't believe this 5 points rule is remotely true nowadays, but that's another story). This is just another example of the flaws of our electoral system where one party could get fewer votes but more seats. Ok so why is the PC so much more efficient? One explanation is of course that my model is just wrong. This is completely possible but not super interesting (cause I won't know it unless we actually get the election). Another explanation is because the NDP is wasting votes in some regions and too far behind in others. The PC vote is really evenly spread while the NDP vote is more concentrated in Hamilton/Niagara and the North. The NDP remains low in central Ontario and the east and, more importantly, is still behind the PC significantly in the GTA (in Toronto proper, it seems to be a 3-way race and you can just roll a die to make your prediction). The GTA is really the key. It's the source of many seats. In the projections above, the Tories are winning 21 seats in the 905 while the NDP is only at 8. So what the NDP needs right now is to increase its share of votes in the GTA. And possibly in a non-uniform way but instead by increasing more in some key ridings. Of course, this is easier said than done. The vote inefficiency of the NDP in the GTA seems particularly severe. Look at the map below, from Wikipedia. The GTA was the life source of the Liberals in 2014. The Tories actually lost seats there between 2011 and 2014 (as well as in the greater 905 in general). For the NDP, it finished below 20% in the 905 and only won 2 seats. The best measure of the inefficiency of the NDP vote is to calculate the standard deviation within the 905. The higher the standard deviation, the more volatile the NDP vote is, which means it's high in a few ridings but also very low in others. For 2014, the standard deviation was around 11 points for the NDP, almost twice as much as the PC (interestingly, the NDP is close to the Liberals but the Grits were also ahead there, so it's less of an issue for them). In average the NDP were almost 30 points away from winning ridings while the PC was only around 15 points away. And there as well the NDP's deficit varied quite a lot between ridings. So the big question this year is really: who will win the lottery since the Liberals are about to lose most of their seats? Based on what we just saw, the PC is in a much better position to win these seats. The NDP really has only two ways here. First, it could simply take a huge lead overall in this region, thus compensating for its inefficient distribution. The second method is to hope that its gains in votes will be optimally distributed in the right ridings. In the east 905, we are talking of ridings in Vaughan for instance that could be the first to go NDP (among the ones not already going orange) or Ajax. On the other hand, the NDP would likely be wasting votes if it was to increase mostly in Thornhill or Markham. So either on the left or right side of the east 905, but not in the middle. In the west 905, the NDP should hope its gains aren't in the ridings closer to Hamilton (Oakville, Burlington) and more in ridings like Mississauga (and Brampton, but it's already projected to go NDP). In general, the west of the 905 (so the Peel Halton region) is better for the NDP than the east (the York region). There are 4-5 ridings where the NDP is within striking distance. But the others? The others are harder. In some of them the NDP is likely still a good 20 points away. Still, taking 4 ridings away from the PC would go a long way to restore a more balance race between the two. Good riding targeting by the NDP and this race is a toss-up. So what the NDP needs right now if it actually wants to win on June 7th is a good transfer of Liberals votes in the GTA. Andrea Horwath needs to inform and convince these voters. Inform them that the OLP has no chance of stopping Doug Ford (note: the latest Leger poll showed just how uninformed most voters were. 50% of Liberal voters thought their party had the best chances of winning the election!) and then convince them to actually make the jump. I'm sure she'll spend a lot of time repeating this during the last two weeks (and the debate). The other region where the NDP seems to be currently inefficient is the east, including Ottawa. But this is less important than the GTA in the overall vote efficiency of each party. With that said, a OLP to NDP transfer in Ottawa (along with the one in the GTA) would give Horwath a majority. So here you have it. 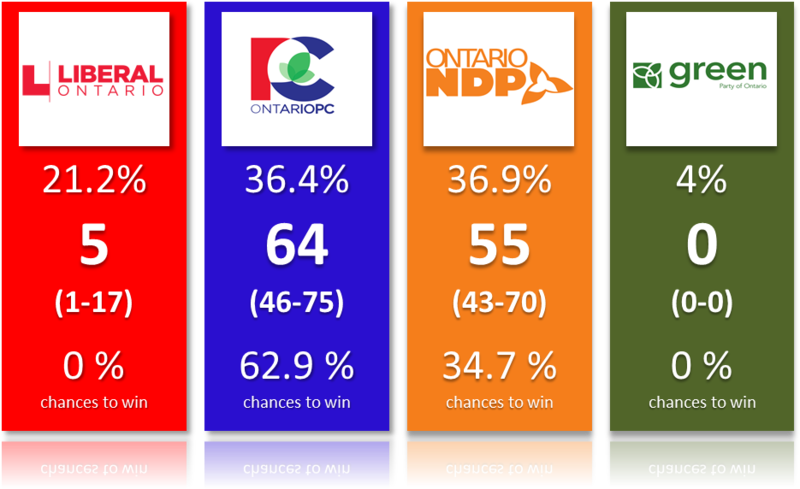 Unless polls start showing a PC rebound or a large NDP lead, this race will become incredibly competitive. But the Tories have the vote efficiency going for them. They can lose the popular vote by 2 points and still win more seats. They would likely not get a majority however. But that's for another article. I'll try to update the projections quickly when we get the new polls today.